An especially fibery day today. Most significantly, the Troublesome Scarf is finished! As you can see, these are somewhat corroded. 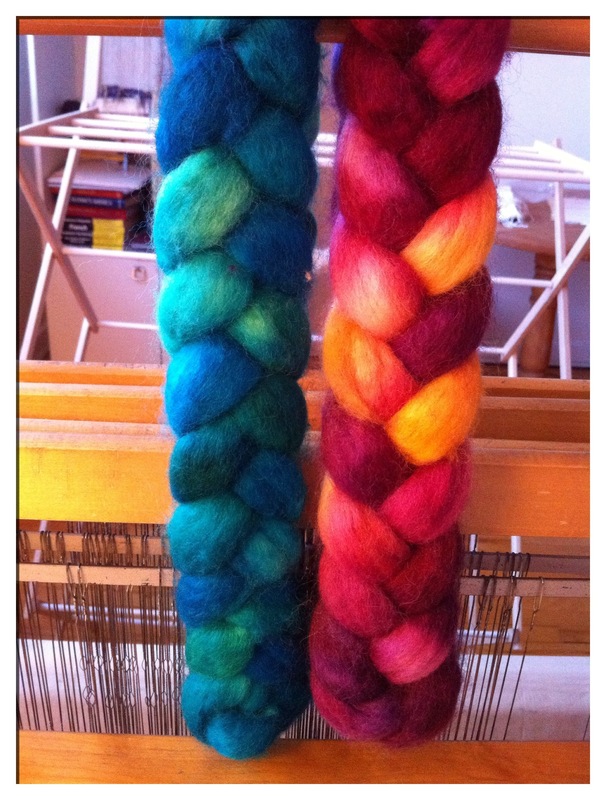 I’ll clean them before my next project goes on the loom, but most of the smudging came out with careful washing. Even with my admittedly pronounced perfectionistic streak, I think the scarf looks fine, and deem it wearable in the workplace. I also had my second spinning class. I’m finding that taking a class prompts me to do things I wouldn’t have tried otherwise; today I made my first three-ply yarn. Afterwards, I succumbed to the allure of some braids of (to use the technical term) fluff. I am weak, but they are beautiful. 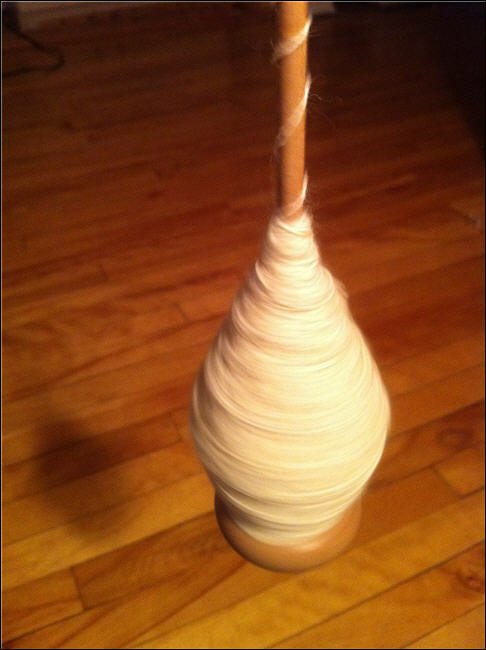 So, when I got home, I took to the spindle and spun a few yards of two-ply using one of the new techniques I’d just learned. Fortunately, there are plenty of other projects brewing. For one, I’ve been itching to try tambour embroidery with cloth that’s still on the loom. I’m still in the early stages of planning this project, and I want to have a back-up plan for the warp in case the idea doesn’t pan out, but I’m looking forward to it nonetheless. I’ve also got a rug warp wound and ready to be put on the loom. What I don’t have: weft. I’m thinking of tying together all of the thrums and scraps of yarn left from my various other projects, wrapping them on my ski shuttle, and seeing what happens. Yep, the crafting has definitely taken a textile turn of late. There’s plenty else on the to-do list, though, and maybe one of these years I’ll get to it all. However, since I normally only get to my crafts late in the evening, the sun has yet to shine on many of my projects. Working so late poses some obvious challenges: fatigue is not the ideal state of mind for some of the more technically demanding aspects (also known as “fiddly bits”) of making well-crafted objects. Once in a while, it’s nice to step back from the challenges and work on something repetitive. Last night I spent my crafting hours, not concocting some interesting new creation, but working on the projects that stack up on the coffee table waiting for me to get to them. I don’t mind. Many of the hobbies I enjoy are based on lots of little steps, rather than a single process repeated; it gives me a delicious sense of productivity when I complete even the tiniest of crafty chores. 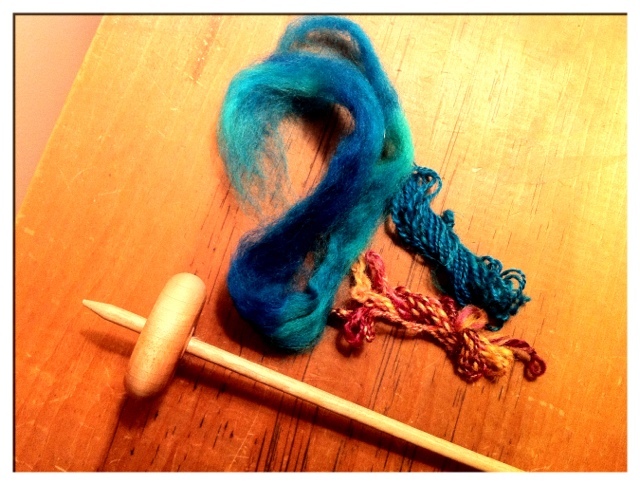 These little balls of yarn are ready to be plied in my spinning class this weekend. 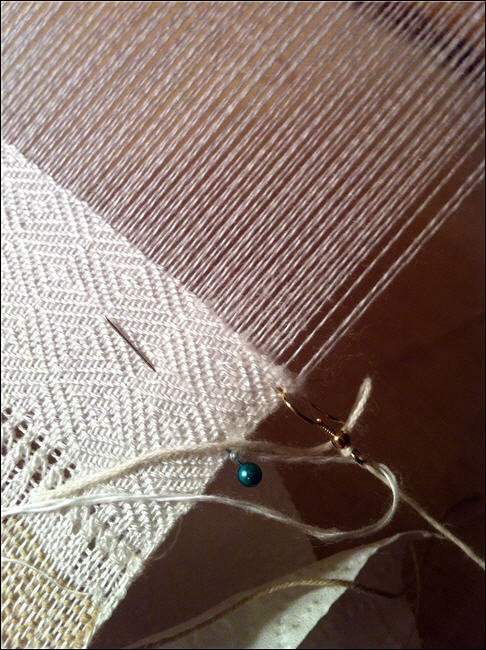 Weaving is the perfect example. 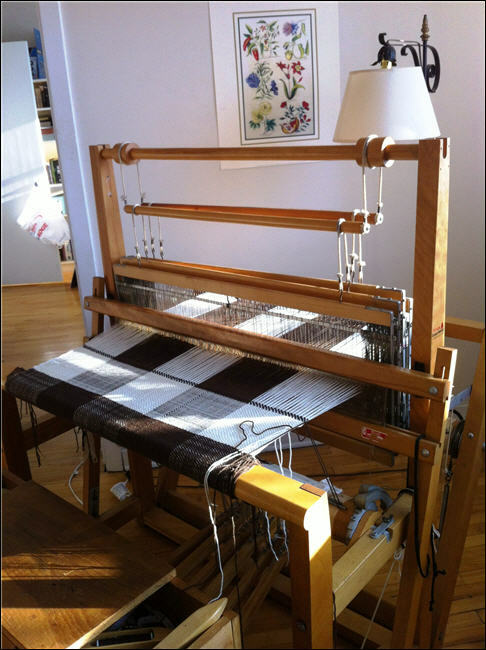 For the project you see below, it took me approximately forever to get through all of the steps necessary to wind the warp, get it on the loom, weave samples, troubleshoot problems, and begin weaving without disastrous consequences. Can you spot the problem? 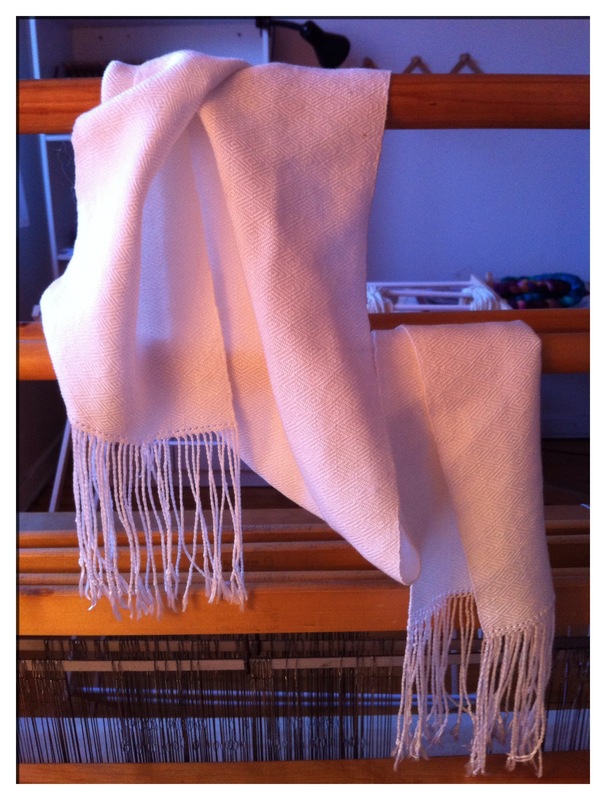 …and I was able to weave the rest of the scarf in an evening. Whereupon it made its way to the coffee table and sat waiting for me, along with the spindleful of yarn and a number of other patient projects. 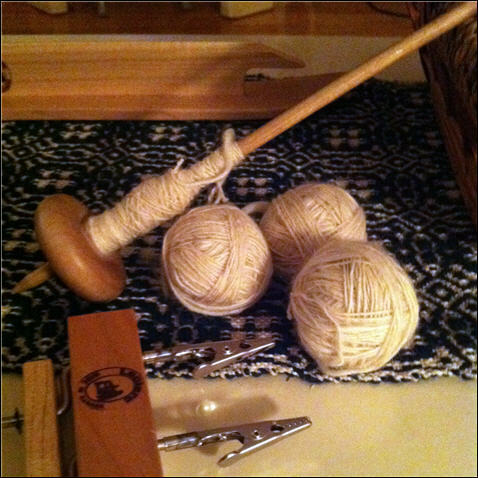 When I got home late yesterday, tired and irritable, they caught my eye– so I spent the dark winter evening enjoying the small tasks of winding balls of yarn and twisting fringe. 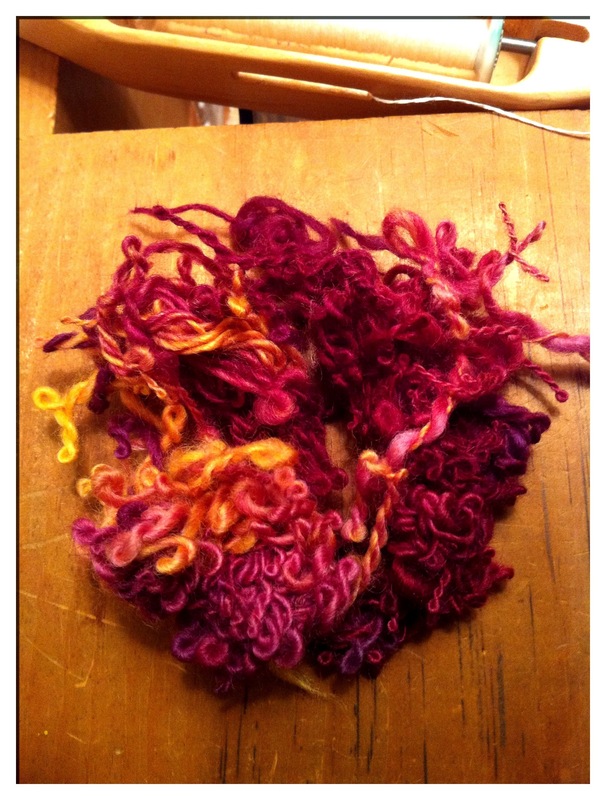 And when I saw my nearly finished scarf on the table this morning, I took a photo with the first light of the day. 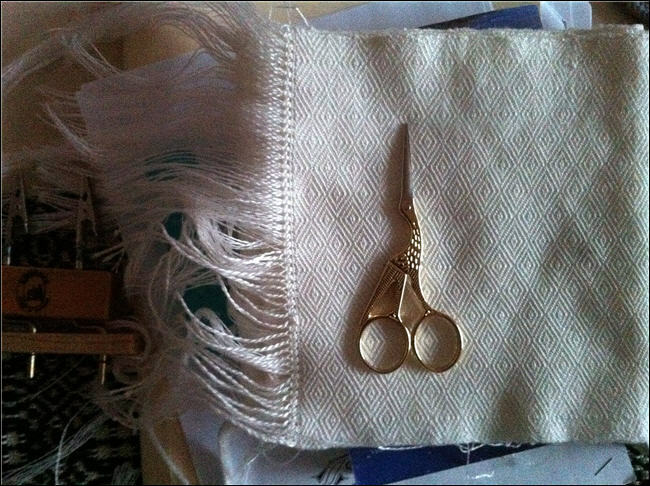 Welcome to my fledgling craft blog! I’ve admired the online galleries and blogs of many different craftspeople and artists, and hope you’ll find something here that interests you as well. Still need to make floor: how to represent dirt? Rushes? After months of scrawling these cryptic ideas in various notebooks and on the back of supermarket receipts, I am finding the brevity of the entries and the monstrous proportions of the list to be somewhat at odds. In other words, I can’t remember what half of it means! It seems that a more comprehensive approach to record-keeping is in order. So, what do I make? Here’s a sampling of current projects. 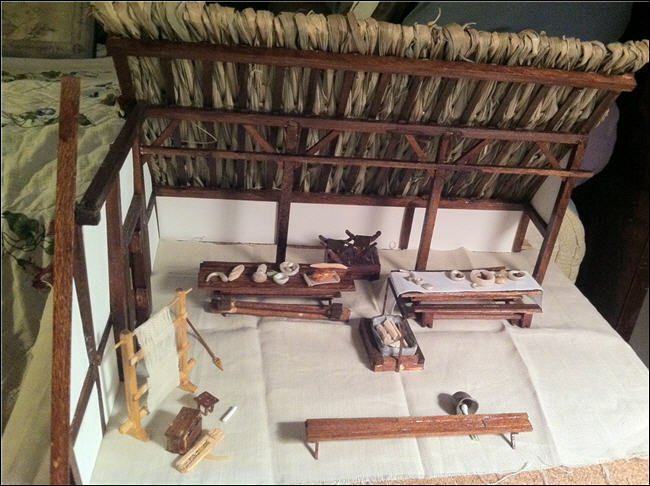 First, a historically inspired, more than historically accurate, attempt at an Anglo-Saxon mead hall in 1/24 scale. For this project, I am valuing structural integrity (i.e. plenty-of-gluity) over strict adherence to historical construction techniques. Some people might be able to carve out a functional mortise-and-tenon joint in half-inch scale, but they are more skilled than I. 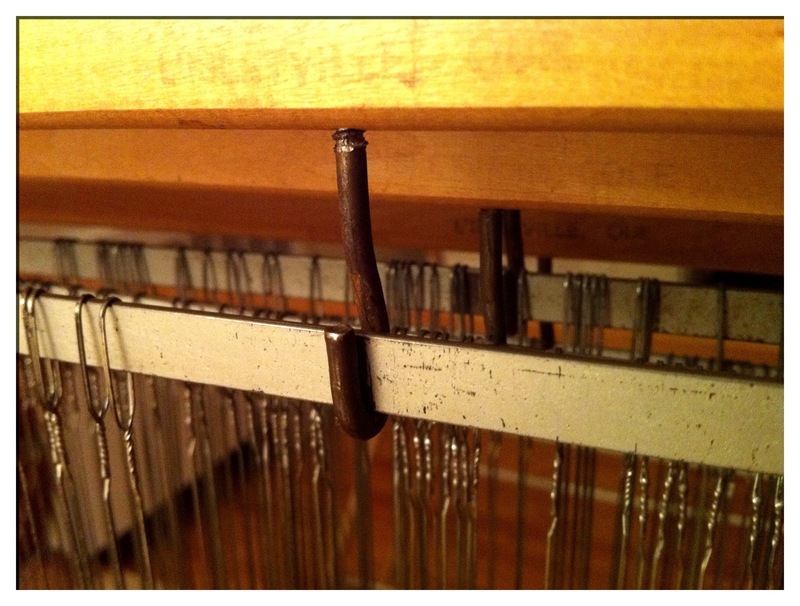 My beloved loom. Pictured is a half-woven blanket, part of a pair that I made as my first project. In future posts, I plan to go into more detail about specific projects and techniques. Hope to see you then. 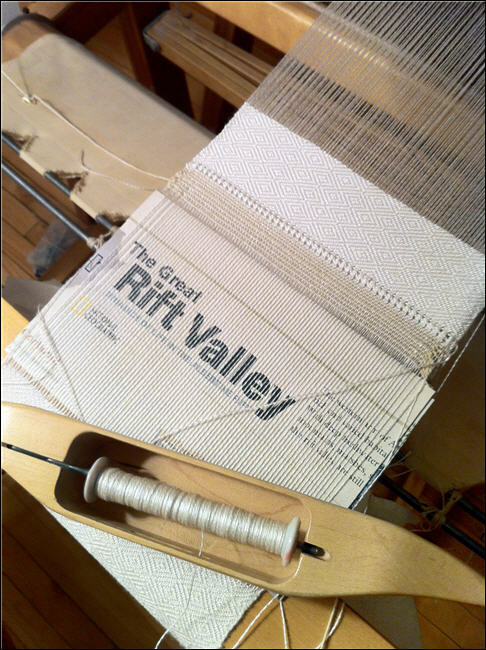 Notes on weaving, historical costuming, and other eccentric pursuits.